يقع فندق هيلتون سيرفرز بارادايس في سارفرس باراديس, جولد كوست, هو خيار شائع بين المسافرين. يجذب هذا الفندق ذو 5 نجوم، والذي يبعد 0 km فقط عن وسط المدينة و 22km عن المطار، الكثير من الزوار سنوياً. يشكل هذا الفندق ملاذاَ مريحاً للاسترخاء ويمنح زواره فرصة للاستجمام والتجدد، وهو يقع على بعد خطوات من المعالم السياحية الكثيرة للمدينة كمثل: اورشيد افينو, Ripley's Believe It or Not!, Tune Up Bar & Karaoke Studios. إن الخدمات الممتازة وحسن الضيافة العالي في فندق هيلتون سيرفرز بارادايس تجعل إقامتك تجربة لا تنسى. لضمان راحة ضيوفه، يقدم الفندق الخدمات التالية: خدمة الغرف على مدار الساعة, مرافق مخصصة لذوي الاحتياجات الخاصة, واي فاي في المناطق العامة, خدمة صف السيارات, صف السيارات . في الفندق غرف نوم يتجاوز عددها 169، كلها مجهزة بعناية وجمال وبعضها مزود بـ تلفزيون بشاشة مسطحة, اتصال لاسلكي بالإنترنت, غرف لغير المدخنين, مكيف هواء, مكتب. صممت خدمات الاستجمام في الفندق والتي تتضمن حوض استحمام ساخن, مركز للياقة البدنية, ساونا, حمام سباحة خارجي, حمام سباحة داخلي لمساعدتك على الاسترخاء والراحة. اكتشف مزيجاً ساحراً من الخدمة الاحترافية والخيارات الواسعة من وسائل الراحة والمتعة في فندق هيلتون سيرفرز بارادايس . Me and my friend just stay for 1 night, it is very convenient to the tram station, restaurants, tourist information and to the beach! Hotel room is clean and with huge bathroom. Just I don't know why, in the morning the hotel staffs kept knocking our door few times. Besides, the door of the hotel room was always shaking while other rooms was closed or opened. Very beautiful hotel, inside and outside. We could see the ocean from the balcony and the window in the bathroom. The bathroom was so huge and there are so many pools in the hotel. Love the huge lap pool although the water was really chilling. There are indoor pool and heated outdoor pool too. Very satisfied with the facilities and the location. Great location. Great executive package. Great views from room. Lovely and spacious rooms, however, request a higher floor room if you are a light sleeper over the weekend. When we booked this hotel, they asked what time are we arriving? I said that would be 4.00am and if that would be a problem because i have 2 young kids with me? I got no response. Then i have sent a second email closer to the date. Still no response. When we arrived at the hotel , receptionist told us she has no rooms available and they have received no email from us. When i showed her the emails she went to check with her manager and told us we can stay with a baby at the lobby. I said that is unacceptable my baby was on antibiotics and we needed a room. Then she said she might have a room available at the cost of $550.00 excluding taxes. Then she said she has another room at $400.00 . I had no choice but to pay considering i was there with kids, but i find it so rude and unacceptable saying they had no rooms, then they do, then they have cheeper one, when i could have booked a room from Australia if someone actually read our email. Staff disgraceful,service wait times at reception disgraceful. Buffet breakfast a ripoff. Bathroom ridiculous setup after a shower the whole toilet area wet. Car park area is a nightmare. Would never stay their again. My stay here was amazing. I felt like my partner and I were being looked at differently as we were young and had booked the executive stay. Other than this our stay was amazing and service was awesome. Would definitely stay here again. Loved that the fitness centre and pool are open 24/7. Beautiful, tidy rooms. One tall building in the way of full ocean view on left side but not bad. My check-in experience was bad - it seems that everyone was getting upgraded that day, awesome! But went to my room and it was a standard room (not a king relaxation suite that I'd supposedly been upgraded to from the king relaxation room). Went back and spoke to another receptionist (should've spoken to the same lady!) who said the booking from Agoda confused my room type for a Standard room, and he gave me my original room, the King relaxation room. Sad that I missed out on my upgrade I was given and all the fuss from the confusion. Tainted my stay at the Hilton. the hotel is located very close to beach and center of main shoppings and restaurants district. a block away from beach. a block away to supermarket, very convenient to buy generic items ie. water, fruit, etc. the hotel offers buffet breakfast. my recommendation, try once and browse surrounding restaurants. well-known restaurants are just a block away, ie. hard rock cafe, hog breath, etc. if you get suit room, you have access to executive lounge where you can have unlimited Expresso coffee, beers, soft drinks and ice cream. My conference was in the Hilton so staying here made sense.I enjoyed my stay and all the staff were friendly and helpful.I would recommend it as its so close to restaurants ,the social scene and the beach. King size bed is very comfortable and we asked for a firmer pillow. Layout was good with a separated resting area. The hotel could have provided toothbrush and bedroom slippers in the room; though we can get them upon request from the reception. Front staff could not advise the bus to theme park and directed us to check with concierge. 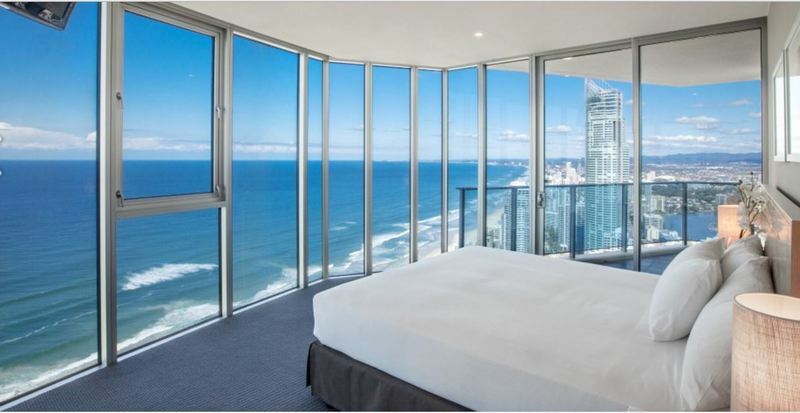 Great location in surfers paradise. Close to restaurants, clubs and beach. My Room was very clean but average facilities. Bathroom door did not close well at all and offered poor privacy. In addition, no tooth brush or tooth paste provided which is pretty standard in many hotels. Wifi strength average. I expected more for the price. came down from my cairn trip to gold coast. though room was only the 7 floors,it was considered very high (probably an equip high of 16 storey feeling)view was great facing the beach. Had dinner at hilton salt & grill.location had many nice shops. Great location but otherwise just ok. Room was relatively large but does not appeal. Breakfast buffet was good except bread and croissants were heated up a few times. To get a fresh ground Coffe and a Cappuccino we had to pay up $ 5 for each. Sounds a bit odd as the Buffet is advertised for $ 39. Staff was friendly.